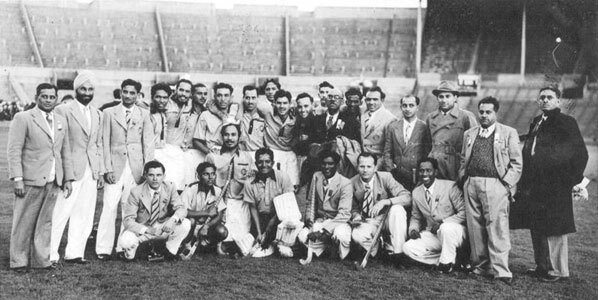 India's record in the 1948 London Olympics - Played 5, Won 5, Goals For 25, Goals Against 2. After the final, V. K. Krishna Menon, free India's first High Commissioner to England, gave an official reception at India House. The Indian team then went on a goodwill tour of the European mainland - visiting France, Czechoslavakia and Switzerland. This is a group photograph of the Indian team prior to their match against Switzerland in Geneva. The team started its return journey to India from Liverpool, England. The ship's ports of calls presented enchanting sights - at Port Said there were jugglers, and they also got off at Aden to visit places of interest. When the team reached Mumbai, a red carpet welcome was given to the gold-medal winning heroes.